In a collaboration worth noting, citizen scientists and the European Space Agency came together to identify a new phenomenon in the sky called ‘Steve’. 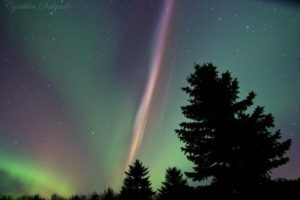 Steve is different from other auroral phenomenon in the fact that it is a vertical streak as compared to horizontal streaks by other auroras. The Alberta Aurora Chasers is a facebook group with citizen researchers who track the skies looking for Auroras. They exclusively track the sky in Alberta which is in northern Canada. 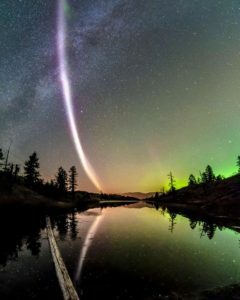 Steve, found by the AAC forms a distinct purplish or greenish vertical streak in the night sky. Auroras are one of the most interesting features to look for in the night sky and their formation is also quite interesting. They are usually formed when the charged particles which are generated by the sun hit the earth’s atmosphere. These charged particles are drawn to the Earth’s North or South Pole. At the poles, these charged particles collide with the neutral particles and produce flashes of light. This phenomenon is known as auroras. One of the most famous auroras is the Aurora Borealis formed at the North Pole. Photographers who follow strange new phenomenon like Steve had first concluded that this was because of protons hitting the atmosphere. This was later disproved because the normal auroras are cause by electrons while protons would only diffuse visible light. Steve would have to be formed because of different reasons. Researcher Eric Donovan from the University of Calgary, Canada first heard of Steve when talking to members of the Alberta Aurora Chasers. Eric coordinated with the Alberta Aurora Chasers and compared their data with data from Swarm. Swarm satellites are property of the European Space Agency and they study the Earth’s magnetic field. Using data from swarm and ground based cameras which monitor the sky; Donovan was able to study Steve.